Friendly family with 2 boys aged 11 and 13 years old. Arcachon is a highly praised coastal destination in south-west France, near Bordeaux. 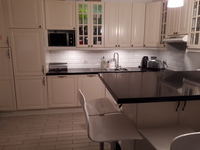 Our house is a traditional « arcachonese » house, entirely refurnished 8 years ago. Although it’s a summer house it’s fully equipped and cosy, as we spend a lot of time in Arcachon. There is a main house (70sqm) plus a separate "cabin" in the garden (independent room with its own bathroom ; 15sqm). The main house is composed of 2 large bedrooms (parents’ bedroom (1.60 bed) and a children’s bedroom with 2 bunk beds (4 children capacity), a bathroom with separate WC, a living room and open kitchen. Two terraces (north and south), as well as a small garden (south, calm, behind the house). Our house is not a huge house, what we were looking for was mainly the location, for us the best neighbourhood in Arcachon. Situated in Arcachon, ville de printemps, between Pereire and Ville d'hiver, less than 100 meters from the sea. It's a very calm residential area but at the same time close to all the commodities: 15’ walk from the railway station (we live in Paris throughout the year), and 2 buses lines nearby. 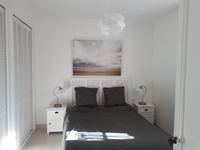 Close to the beach (less than 100m) and 2’ from the nicest beach of Arcachon (Pereire). 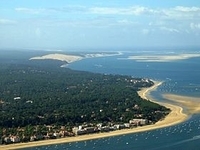 Close to the bicycle path that allows you to go to dune the Pyla or do the Arcachon bay tour. City center is 15’ walk or 5’ with the bike. Residential neighbourhood, with basic shops nearby (bakery, pharmacy, small supermarket) as well as nice restaurants. Dune du Pilat, Arcachon bay, Bordeaux, etc. Bordeaux is 1h and Paris less than 3h (LGV Paris- Bordeux 2h + 45’ TER Bordeaux-Arcachon). Spain is 3h (train or car), Basque country; Biarritz is 2h. Will be found in guest guide. 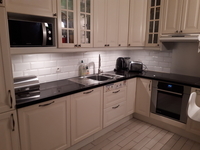 We are a busy and active family, we love being outdoors and travelling, but we also need resourcing at home. We’ll expect the same respect for our home as we’ll have towards our hosts and their house.